The capital and the biggest city is Sofia. Their money is called the lev. The Bulgarian government is a member of the European Union and NATO. Rumen Radev became President in 2017. The population of Bulgaria is a little more than 7 million people. 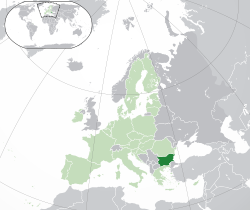 Bulgaria has its own language, called Bulgarian. It is a type of Slavic language. It is related to languages like Serbian and Russian. Bulgaria borders Romania, Serbia, North Macedonia] , Greece, Turkey, and the Black Sea. One of the national heroes of Bulgaria is Vasil Levski who led the fight for independence in the late 1800s. Bulgaria is an ancient country, some places have had people living there for over 6,000 years. The first Bulgarian empire was established in 681 AD. The second Bulgarian empire started about 1185 AD, with Turnovo as the capital. The Ottoman Empire took over in 1396, and ruled Bulgaria for about 500 years. The Ottomans had very strict rules and the Bulgarians suffered. The Bulgarians rebelled several times against the Turkish rulers. After the first Balkan war (1876), Bulgaria pulled away from Ottoman Empire's influence with the help of the Russian Empire who were already fighting the Ottomans. But it was not until 1908 that the whole country of Bulgaria was united as modern Bulgaria. The retirement age for men is 64 years and for women 61 years. It will be 63 years and 9 months for woman and 65 years and 3 months for man in 2032. ↑ NSI Census data 2015. ↑ "Gini coefficient of equivalised disposable income (source: SILC)". Eurostat Data Explorer. Retrieved 31 March 2016. ↑ "Human Development Report 2015" (PDF). HDRO (Human Development Report Office) United Nations Development Programme. Retrieved 14 December 2015. ↑ "Rumen Radev". President of the Republic of Bulgaria. 22 January 2017. Retrieved 20 November 2017. ↑ 5.0 5.1 "CIA - The World Factbook - Bulgaria". Retrieved 2013-03-17. ↑ "What is the average salary in Bulgaria". Answers.com. ↑ "Новини от България и света, актуална информация 24 часа в денонощието". News.bg.